Considering the fact that up to half of the energy used in a home goes toward heating and cooling the interior space, it is smart to make sound decisions regarding your Columbus heating, ventilation, and air conditioning system. Heating and cooling with an HVAC system can become a comfortable investment when it is done efficiently. Below are some tips to make your HVAC system more efficient. Many air filters should be changed every three months, but some as often as every month. Follow the manufacturer’s recommendation as well as simple common sense by checking the filters frequently during high-usage times and replacing as necessary. A programmable thermostat can control how hot or cold a home is every hour of every day within a week. During the summer they can be set to higher settings while residents are away on vacation, and during winter they can be set to lower settings while residents are away at work or school. This is a great way to save on energy costs throughout the year, as keeping a more consistent house temperature also helps the HVAC system to run more smoothly. When an HVAC system is more than ten years old, or if it no longer works properly it is probably time for a replacement. Prior to replacing an entire HVAC system, it is prudent to check for air leaks in ducts, which can be a major cause for heating and cooling issues. If it is determined that it is time for a professional to come in and install a new HVAC system, the savings in energy will be quite dramatic indeed. Use any or all of the above tips will make your Columbus HVAC system more efficient, while saving you money throughout the peak seasons of heating and cooling usage. 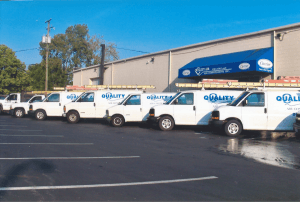 Call Quality Air Heating and Air Conditioning today if you need heating service in the Columbus area!